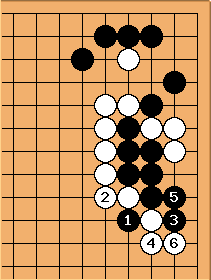 here is a type of knight's move net. 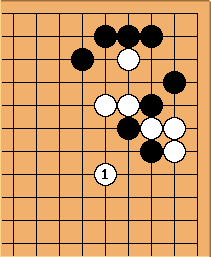 This is an example from Sakata's Tesuji and anti-suji of Go. 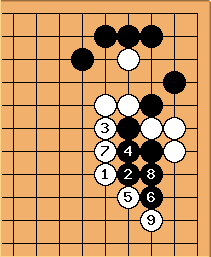 Black can try to squeeze White into shortage of liberties; but after there is atari at a.
ABunchaNumbers: As an ignorant amateur, I don't see why b doesn't do Black any favors: capture two stones, remove atari at a, and preserve atari at . It means that fighting continues, but seems to keep a hold on the corner at the least. I assume this wouldn't actually work, so I'd like to hear why. Thoughts? 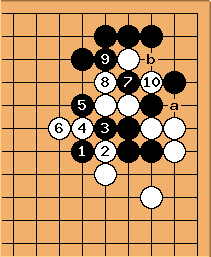 -- firtree (KGS 15 kyu): Since black b is immediately answered by a, and the following capture - by filling the place of the unmarked captured black stone, this gives Black only one captured stone and no atari at . 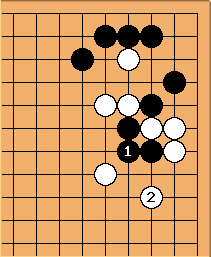 So these moves can only be considered as ko threats, and are usually saved for later play (or prevented by White's play at a or b in advance). --TAB2 (19 Kyu): Dear ABunchaNumbers?, , white capture it with the 10 stone. You see? Black has three liberties, White four.